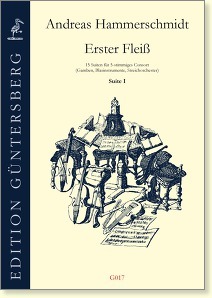 In these two editions the Bohemian composer Hammerschmidt has published a total of 91 dance move-ments of 5 parts. In the original these movements are in an arbitrary order. For the practical playing the editors, Leonore and Günter von Zadow, have grouped these movements into 15 suites. These gay, and for the most part simple, dances were written for viols (Violen ), however they can be performed equally well by wind instruments or modern strings. The middle parts are notated in both, alto and (octavated) treble clef. The collection contains also some three-part pieces, see G030 and G031.